Clear mucus naturally: do a two-minute breathing exercise. Simply put, this amazing technique works because the body needs oxygen to function (and to keep mucus amounts in control). The activity below helps boost one’s oxygenation. Now, what to do! Relax your muscles. You need to hold your breath now, but only after your normal exhalation – don’t blow out any air forcefully. When your body naturally exhales, pinch the nose closed. Hopefully you keep your mouth closed most of the time and you have it closed now – no really. So you start developing a desire to breathe or an air hunger. Don’t stress too much – release the nose when you start to get uncomfortable. Take an in-breath through the nose and only using your tummy, if possible. The chest and shoulders “like” to get involved in our breathing, but we actually only need their help that way during very intense exercise. Reduce your breathing. Make your inhales at this time be a little shallow, say 20-30% less than normal. This is pictured above. We are accumulating CO2 at this time. In contrast to popular belief, carbon dioxide is crucial for us to get oxygen to body cells. 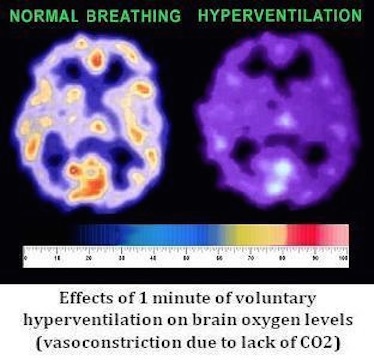 Check out the effects of over breathing on the brain in the image below. Breathing heavy actually REDUCES oxygen levels in all body organs. Oxygen is shown in light colors here. Back to the breathing exercise. You are taking somewhat small in-breaths nasally, with all exhalations being passive (or totally relaxed). Try to be relaxed for the entire exercise, with only the abdomen being active, for inhalations. In two or three minutes, you should get relief from excessive phlegm. Allergies or a lot of inflammation may require more work than just one breathing session. 1. Avoid exposure to your allergies. These are individual and may include cat proteins, pollen, dust. 2. Practice reduced breathing a lot. (We just talked about this above.) Make sure that you don’t have solid food in the stomach for breathing sessions, though. Wait a few hours (or until the stomach is empty) after meals. 3. Learn about Earthing (grounding the human body) and do it often. This will reduce inflammation in your body. 4. Avoid foods that cause you to develop extra mucus. This may include meat, fish, gluten products, and dairy. 5. Stop coughing and blowing out precious CO2 without need.